Yes, follow. Follow your imagination to a place where time moves gently and the song of the wind in the trees lulls you to sleep at night; to a place where the rhododendrons bloom scarlet in the spring, and the redwoods soar against the summer sky. Can you remember what it was like to sit in a shady garden with a book in your lap and watch the trees throw a shiver of dappled light and shadow across the lawn? Do you recall the smell of a hot, freshly baked scone and taste of a home-made pecan pie? Nostalgia doesn't have to be folded away in a scrapbook of the past. Not if you are in Mendocino. Not if you are at the Joshua Grindle Inn. Like the haunting melody of The Fantastiks, life here is still tender, and tranquility dwells in the morning mists, the pine-laden fragrance of the evening breeze and the glow of a fireside hearth at dusk. The town itself was once the site of a lumber mill, and the early settlers who hailed from the east coast brought with them the architectural heritage of New England. Even today, visitors strolling past the churches, store fronts and homes of Mendocino, may be forgiven if they fancied themselves in the midst of a little town in Maine or Massachusetts rather than one situated on the California coast. Joshua Grindle, like his contemporaries, arrived in Mendocino in the latter half of the 19th century and worked as a raftsman at the Mendocino Lumber Company. On his marriage to Alice Hills, the bride's father deeded a two-acre estate to the young couple, and Joshua commenced construction of their home 1877. Sadly, Alice died in childbirth before this was completed, but Grindle eventually remarried, switched careers and became a wealthy banker. 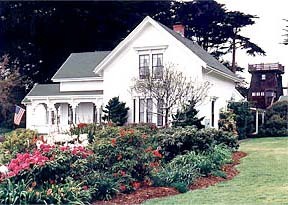 The house that he finished in 1879 remained in the family's possession until 1968. Today the owners, Charles and Cindy Reinhart, rekindle memories of a more spacious era as they welcome guests to the Joshua Grindle Inn. With its two-storied white façade and green gabled roof, the Inn is reminiscent of the American Foursquare architecture so dear to the hearts of Victorian New Englanders. In keeping with that old-world tradition of elegance and hospitality, the rooms are filled with Early American furniture, antiques and paintings set against the backdrop of vaulted ceilings, four poster king or queen size beds and wood-burning fireplaces. Blended into the ambience of yesteryear are the luxurious accoutrements of today's world-whirlpool tubs, cabinet-concealed TVs VCRs and stereos have been installed in some of the rooms. Grindle Inn's main building and adjacent saltbox cottage are complemented by another addition: a three-storied historic water-tower. Back in the mid-1800s the town erected storage reservoirs-some towering to a height of sixty feet-so that its residents could avail themselves of a piped-in supply of water to their homes. The water towers have fallen into disuse now, but Grindle Inn's reconstructed tower (surmounted by a widow's walk) is an emblematic tribute to Mendocino's early years. 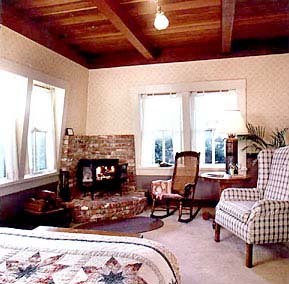 Country pine furnishings and a Vermont casting fireplace lend an air of nostalgia to the lodgings in the water-tower. The rooms on the upper floor, overlook cypress fringed lawns, and beds of flowers drowsing in the afternoon sunlight. Somewhere in the frenzy of today's world with its commuter-choked freeways, its technology-driven tumult of beeping cell-phones and its tyranny of deadlines, we have sacrificed the gift of the unhurried moment. Yet there was a kindlier time when housewives prided themselves on the art of cooking; a time when we peeled, chopped and stirred our apple chutneys or strawberry jam into bubbly thickness and the wild honey which we dribbled over our waffles came from a neighbor's farm. Relive those memories when you join Charles and Cindy at breakfast-although at the Joshua Grindle Inn, this isn't a mere homespun meal. It's an experience. The Reinharts are gourmet chefs who offer their guests such gastronomic delights as Mandarin Almond French Toast (served with maple syrup, a dollop of sour cream and a twist of orange), or nutmeg spiced Baked Pears with vanilla yoghurt. Their culinary repertoire includes Cider Braised Apples smothered in walnuts and dried cranberries, Apricot Scones and Spinach Mushroom Pesto Quiche. In response to the enthusiastic reaction of guests over the years, these recipes are now available in a book called Mendocino Mornings. Apart from the splendor of Mendocino's natural surroundings, the town plays host to several writers and artists whose creations are to be found in craft shops, boutiques, art galleries and bookshops along its Main Street. After browsing through them, follow your way to Little Lake Road and Joshua Grindle Inn. Step over the threshold into soft-edged serenity. A basket of home-baked cookies and a split of local wine set out on a side table in your room, awaits your arrival. From the San Francisco Bay area the shortest route (approx. three-and-a-half hours) is along Highway 101 to Cloverdale, and thence along Highway 128 through the Anderson Valley. The alternative (five hours' travel time) is to take Highway 1 which curls along the California coastline. Approaching from the North along Highway 101, turn west on Highway 1 at Leggett, or follow Highway 20 from Willits to Fort Bragg. Visit historic Fort Bragg; ride the Skunk Train Railroad which still uses a vintage steam engine. Drop into the Mendocino Coast Botanical Gardens, or hike through any one of four State Parks in the vicinity. Other activities include canoeing, bicycling, horseback riding, golf, tennis, scuba diving and chartered fishing trips. Several companies offer theatre, opera and concerts throughout the year. The town also boasts a variety of fine dining establishments. Rooms: 10 rooms all with private baths, six with fireplaces, 3 with whirlpool tubs/separate glass enclosed showers, 3 with deep soaking tubs, 3 with ocean views. Queen or King beds, parlor and breakfast room. Amenities: Full breakfast, afternoon high tea in the parlor, complimentary wine, luxurious robes, concierge services. Address: 44800 Little Lake Road, P.O. Box 647, Mendocino, California 95460. About the photos: Top: Margaret Deefholts. All others, courtesy Joshua Grindle Inn. 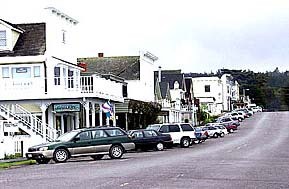 Top: The town of Mendocino, California. Next: The Joshua Grindle Inn, showing the Water Tower. Next: A room in the Water Tower. 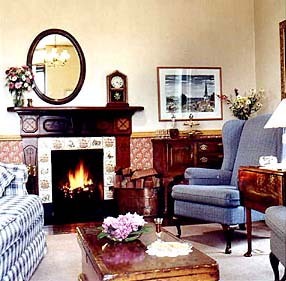 Bottom: The elegant and comforable parlour fitted with antiques and paintings. Margaret Deefholts is a Canadian author and freelance travel writer/photgrapher. Visit her webiste at www.margaretdeefholts.com for more travel articles and information.